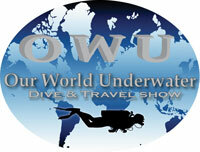 Our World-Underwater – Chicago: Weekend at a glance | Dive Industry Association, Inc.
Only 10 days away, are you ready? The Convention Center will be full of booths from SCUBA stores, Manufactures, travel destinations, apparel and jewelry. We have over 50 Seminars taking place and a lot of work shops, like the DAN Hazardous marine life on Saturday. This entry was posted in Events & Activities, Local Diving. Bookmark the permalink.